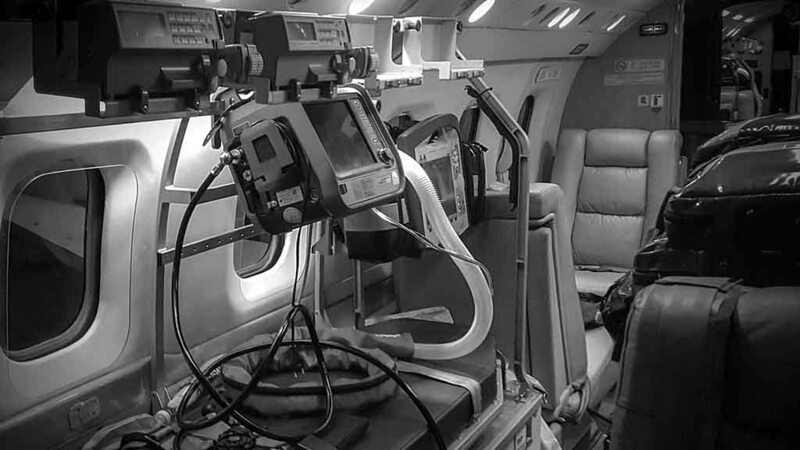 High end neonatology and pediatric intensive care equipment combined with the highest medical standards, guarantee patient transports on the highest level. We offer equipment which equals the bests high level pediatric ICU`s of German university children hospitals. The Hamilton T1® is the best mobile respirator on the market for children and neonates, with advanced pediatric and neonatal ventilation modes, equaling the performance to a fully featured ICU Ventilator. The Hamilton T1® is certified for ambulances, helicopters and airlines. A minimal tidal volume of 2ml enables ventilation of extremely small premature babies as well as fully adult patients capabilities. The Corpuls C3® enables us to have uninterrupted monitoring for our pediatric patients at every point of a bed to bed transport. It is equipped with ECG, Defibrillator, Pacer, SpO2, NIBP and IBP fort use in children. Up to eight automatic syringes for simultaneous i.v. therapy are possible. Our Storz C-MAC® video laryngoscope and the alternative airway equipment for children (laryngeal mask airway, QUICKTRACH® emergency cricothyrotomy kit) enables us to have the same airway management as in the Operation Room of a university hospital. With the mobile blood gas analysis device (Alere EPOC®) we are able to keep track of the blood levels of oxygen and carbon dioxide in the patients at all times of the transport. Specialy designed equipment for children, like the AccuVein® vein viewing system and the EZ-IO® intraosseous vascular access system, leaves us opportunities in any critical situation. Our mobile sonography and echogardiography device (GE Vscan™) gives us a quick “look inside” of our patients, immediately and non-invasively and helps detect complications as fast as possible at any time. It allows continuous visual reevaluation of the heart function.